I’ve got to say: My life is grand. My best friend Kate sent me home from her house with a The Happiness Project to read on the flight home. In the book, Gretchen Rubin takes readers along as she spends a year exploring happiness with scholarly zeal and scientific curiosity. It’s a good read and got me thinking about happiness without feeling like a self help book. Her point wasn’t cultivating happiness as a cure for clinical depression. By her own admission, her life was good when she began thinking about happiness. Her project wasn’t about changing her life, but about being happier in life. I’d really love to read the book again, take some notes and share some thoughts here on my blog. I’ve subscribed to Gretchen’s blog, but haven’t played with all the toys and tools on her website yet. I’m undecided as to wither I intend to start my own formalized happiness project anytime soon. I’m busy and happy. My life fits me. I have only one nagging concern – one missing and neglected piece. I don’t write anymore. It’s easy to see from my blog, I haven’t blogged. I’ve barely even Tweeted. I don’t have a notebook in my purse or nebulous bits of poems in my head. The idea of writing fiction seems as lost a dream as going to Harvard. Reading about Gretchen, lawyer turned writer, talking about doing what you love, but also working through frustration doing things which lead to long term happiness struck a cord. Writing is great… after it’s done. Or those rare times words gush before I’ve even thought about what comes next. Otherwise, it’s work. I had been thinking on a blogging comeback – and blogging has always been a writing exercise for me – for a while before I took the trip to see Kate. The question I began to ask myself: Why do I still think I ought to be writing? The Happiness Project helped me find the answer: I go back to writing when things are bad in my life. Without fail, I look back on every traumatic event immediately followed by the purchase of a new notebook. When I’m happy, I’m busy living. Too busy to slow down and cultivate what is important to the deepest parts of myself? Seems to be a flaw in my logic. The worst part is how difficult the process becomes when you haven’t kept up. Practice makes perfect. I know full well without discipline comes first in any creative endeavor. Typing out this post has been excruciating, to be honest, and I’ve taken much longer than I intended. What I’m pushing toward is publishing because once I have hit the button, posted to Facebook and Twitter that I have, I’ve accomplished something. One step at a time, I intend to blog consistently enough to call myself a blogger again. I’d love to build on blogging to make words my profession in some form or another. First, I’m going to go ahead and hit publish. Author Tina LouisePosted on July 12, 2011 January 28, 2017 Categories egocentricTags blogging, Kate, plans, reflection, The Happiness ProjectLeave a comment on WHAT’S MISSING? I figure when a good portion of my Christmas day was spent watching BBC America’s Doctor Who marathon, I’m entitled to count the next day as Boxing Day. It’s unfortunate we Americans do not formally celebrate Boxing Day. In fact, all major holidays should come with a recovery day. I’d be all for the Fifth of July and All Saint’s Day being official pajama and rest days. I had a wonderful Christmas. Couldn’t have been more perfect. Spending the day with Chris and his family on our first Christmas together was topped off with a lovely layer of snow. It’s been decades since South Carolina had a white Christmas. 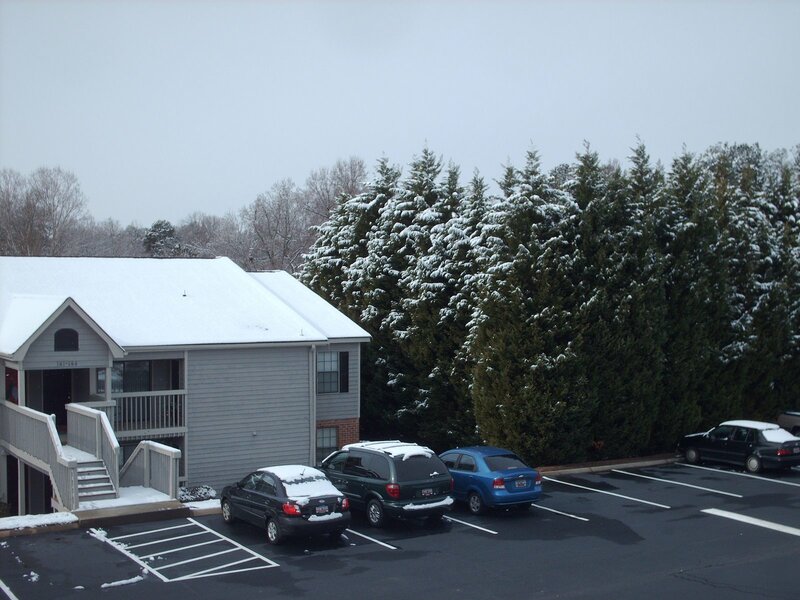 Even the snow was perfect – a few inches of pretty without making the roads dangerous. The picture below was the view from my balcony this morning. The self portrait was also taken on my balcony. 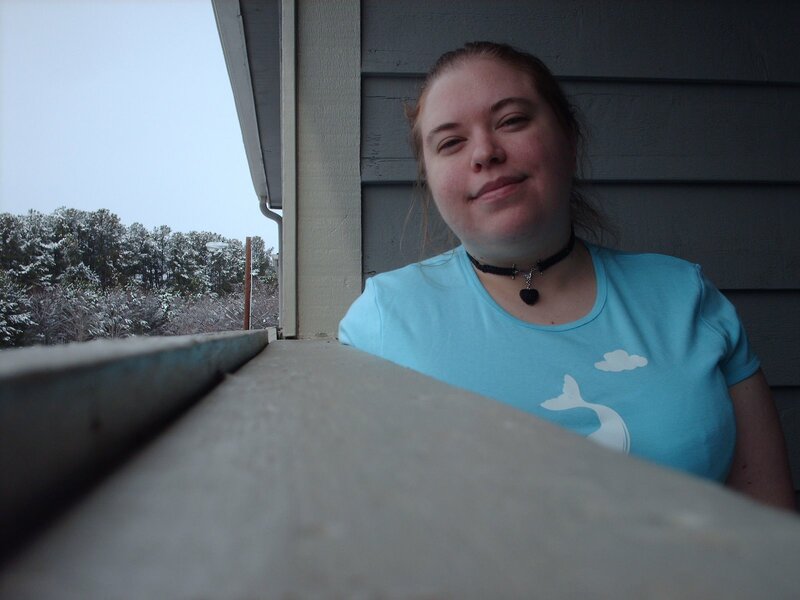 I’d have worn a coat, but I wanted to show off my awesome t-shirt and pretty new necklace. My beloved has wonderful taste on both counts. I didn’t do well with the shirt, I know, but you can check it out on ThinkGeek. I’m mildly obsessed with Hitchhiker’s Guide to the Galaxy. I’m also enough of a geek-snob to love an obscure reference. Was super excited to get a comment on the shirt while out to lunch this afternoon. Even better, I found blue tights to compliment my first geek t-shirt. Someday, no doubt, I’ll have an impressive collection of tees a vast majority of people won’t understand. With any luck, I’ll find tights to go with all of them. Skirts, tights and tees referencing science fiction – we’ll call the look “geek-girly-girl” and go with it. The automatic timer on my camera is doubling as a full length mirror. Of all the things I don’t have yet, like any living room furniture, I would say I’m least worried about a mirror. The camera does the job and leaves me with an image of what I looked like at the before I head out and smudge my lipstick. Not a bad thing. I tend towards being camera shy, so it does me good to put myself in front of the camera. I intend to participate in Cass‘ Sunday Self Portrait, if not weekly, often as I did on the old blog. I took this picture Saturday afternoon in my empty living room before heading out for a Christmas party at a friend’s house. It was a great time. Any evening which includes Chris, good friends, yummy food, and a screening of Wrath of Khan is automatically one of the best parties I’ve ever attended. Our gracious host Doug has an enviable number of Star Trek model starships. Fortunately for everyone, he doesn’t have batteries in them or I’d still be gleefully pressing buttons. I’m digging the red tights, my newest acquisition. The only thing missing is some festive Christmas jewelry. Back in junior high and high school, I used to deck myself out in holiday accessories. Antlers, candy cane striped tights, gaudy holiday themed earrings and necklaces. I’d even made myself anklets with bells on them. If there is one thing I love as much as I love Christmas lights – and I freaking adore lights – it’s bells. Next year, I’ll have to return to the personal tradition that once had my high school counselor call me “festively annoying.” A proud moment. Where there a reasonable excuse, I’d wear bells all year long. Simple question: Where are you from? My answer is a little complicated. by way of Somersworth, New Hampshire. by way of Dover, New Hampshire. After checking with Mom, I added Somersworth to the list. Makes for a eighteen moves in thirty years. As a kid, I went to eight elementary schools – one of them three different times – two middle schools and two high schools. As an adult, I’ve moved four times. I cannot say for sure for how long I’ve landed here in South Carolina. Today, I’m here and have no plans to leave. I wonder who I would have been had I been raised in fewer places. Less open minded. Less adaptable. Less independent. I suspect I’d have been less of a nerd. I would have been more mainstream in my thinking, you see, growing up with a consistent peer group to measure myself against. To think I might have read fewer books, found learning less important or not developed a love for classic science fiction. Horrifying.